Sunday night I went up Mount Baldy for a solo session. I was rolling with the C80ED, which has become my default grab-n-go rig. One of my goals was to test a couple of new eyepieces. Several astro retailers had a big sale on Meade wide-angle eyepieces last month. I was torn between the 20mm and the 5mm Series 5000 Mega-Wide 100-degree EPs (man, is that a mouthful or what?). The 20mm would have been a great low-power, widefield scanner, which is something I’ve gotten progressively more interested in this fall. But for a long time I had been without an EP shorter than my 6mm Expanse, which is not without its problems, so I sprung for the 5mm instead. 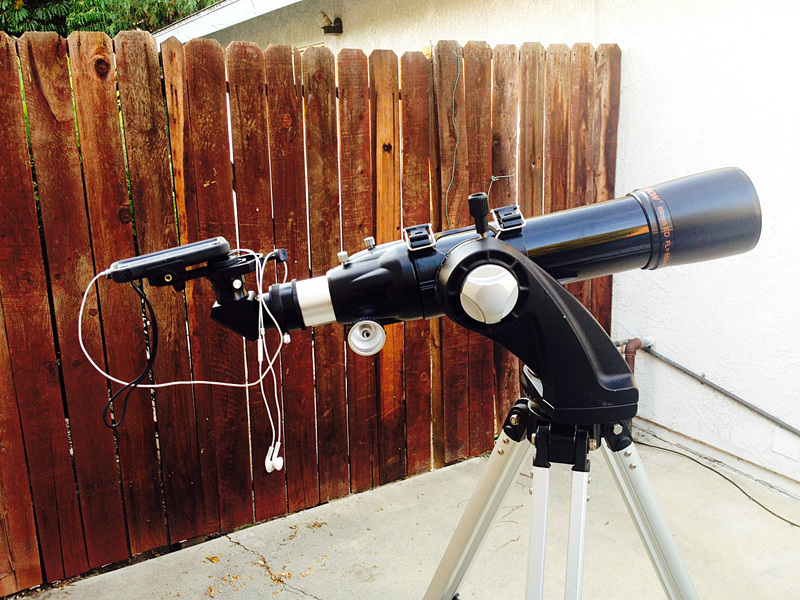 In the meantime, thanks to this thread on Cloudy Nights I had become aware of the VITE eyepieces. These odd little birds come in only 3 focal lengths (at least so far): 23mm, 10mm, and 4mm. They are three-element EPs with one aspheric plastic element and plastic bodies. They’re about $17 apiece on Amazon, or $9 apiece on eBay. I ventured my nine bucks and got the 4mm from eBay, thinking it would make an interesting comparison with the 5mm Meade 100-degree. I had done a quick comparo late Saturday night from my driveway on the moon and the Orion Nebula – more about that in a bit. Sunday evening on mount Baldy I cruised through the highlights in Lyra, Cygnus, and Sagitta. 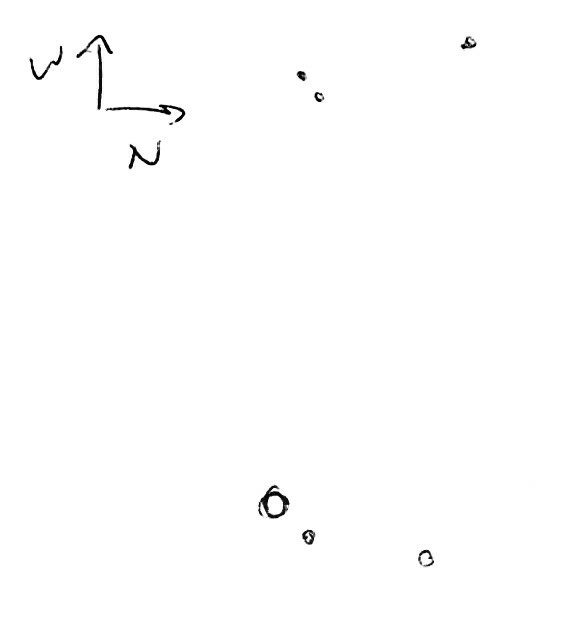 I did a quick, rough sketch in my notebook of the open cluster NGC 6823. It has a curl of stars wrapping up around it like a fiddlehead fern. After that a couple of high school kids and their little brother drove up nearby, and I spent about an hour showing them around the sky – the Dumbbell Nebula (M27), the Double Cluster, Pleiades, Andromeda galaxy, Polaris, M15, 61 Cygni (aka Piazzi’s Flying Star), and finally the Messier open clusters in Auriga – M37, M36, and M38. The kids left about 10:30. Since I was in the area I had a look at M1, and then cruised down to Orion. 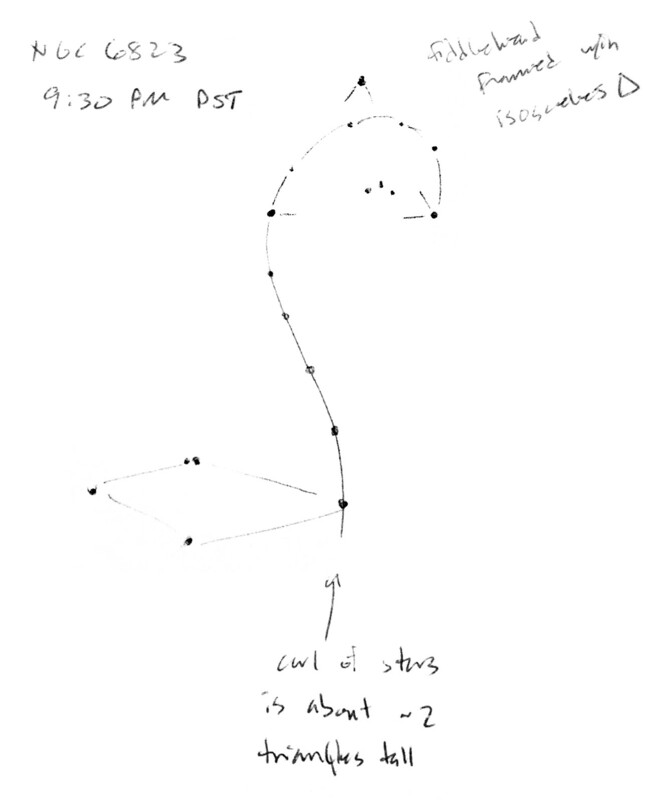 The constellation was slowly crawling over the ridgeline to the east, so I started visiting the bright stars, and in some cases splitting them. First up was Meissa, which was elongated at 68x and cleanly split at 120x in the 5mm MWA and 150x in the 4mm VITE. Mintaka was an easy wide split at only 25x. Seeing was not good, but Eta Orionis appeared to be elongated east-west at 120x and 150x. The view in the VITE was kind of a mess, so I spent a few minutes just cruising around Orion’s belt and sword with the 5mm MWA. Alnitak and its dim companion were widely split. I turned south to Sigma Orionis. I’ll have to check my notes, but I don’t believe I’d ever split this star before. It’s pretty great, with a group of three fairly bright stars and a second group of three much dimmer ones. I backed down to 68x and all six stars were still nicely split, and frankly looked a bit sharper, although that might have been down to bad seeing. So, here are my thoughts and observations on the 6mm Expanse, 5mm MWA, and 4mm VITE. These don’t count as an actual review, as I didn’t have equivalent focal lengths to compare, and I’ve only spent a couple of nights with the two newer eyepieces, observing only a handful of objects. Still, I tried them on a variety of things – the moon, globular and open clusters, the Orion Nebula, double stars – and the strengths and weaknesses were consistent. All of these observations are with the C80ED, so the chromatic aberration (CA) with certain EPs is particularly interesting. 6mm Expanse – Has a small but noticeable amount of CA on bright stars. Eye placement is a bit tricky – I get some kidney-bean and full-aperture blackouts until I get my eye placed just so. Comfortable enough once I get my eye in the zone, though. Halos on some bright objects. 5mm MWA – Sharp from edge to edge. No detectable CA, but the edge of the field does look blue until I get my eye centered. No detectable field curvature. Eye relief is pretty tight – when I move in close enough to see the entire field, my eyelashes brush the lens about half the time (I do have long lashes, but still). I have to move my head around to focus on objects in different parts of the field. Very immersive – I feel like I could climb through the eye lens and into space. The rubber eyecup is annoyingly loose – it frequently comes off with the dust cap. 4mm VITE – Can’t focus the whole field at once. Center of the field is sharp enough, but objects start getting blurry halfway to the edge of the field and are entirely defocused at the edges. ‘Sweet spot’ is pretty small. Considerable CA – makes an ED refractor perform like a short fast achromat! Strong internal reflections from bright objects on the edge of the field, or just out of the field. 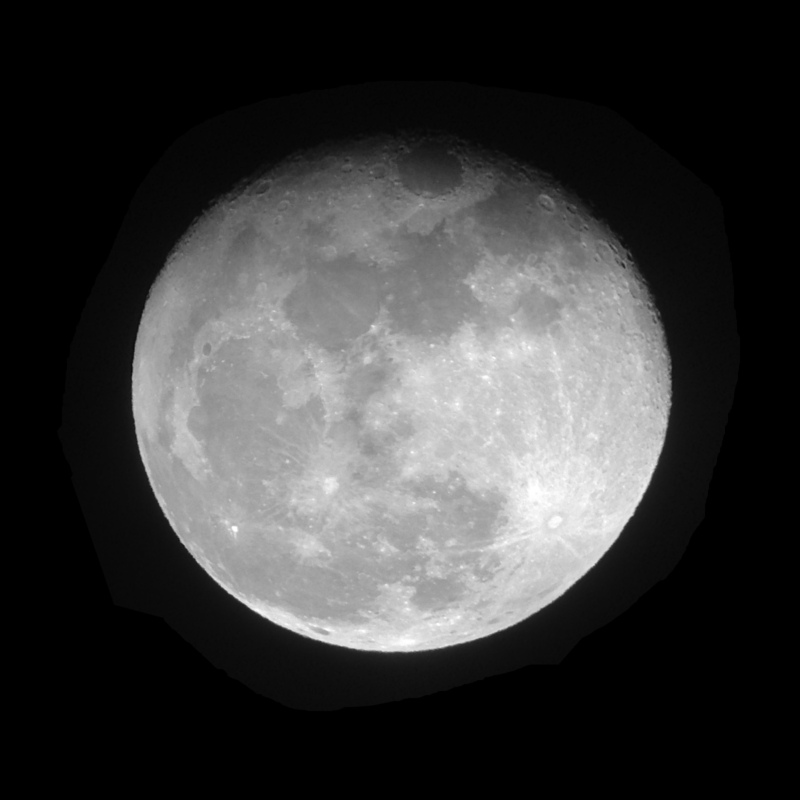 Almost impossible to focus on the lunar terminator if it’s centered – a big bright glow from the lit side of the moon fills the center of the field. Eye relief is tight – eyelashes scrape most of the time. Verdict – The 5mm MWA is a keeper. The eye relief is short but tolerable, and totally worth it for the huge, flat, well-corrected field. As for the VITE, I’m glad I didn’t spend more than $9. I’ve read that these perform better in longer focal ratio instruments, but at f/7.5, the C80ED isn’t exactly fast. So how long does the light cone have to be for the VITE to perform well – f/10? f/15? At those focal ratios, it would take an exceptionally still night for a 4mm EP to be useful. I will try the thing in my Mak and probably in my C102 but I am not expecting much. People on CN seem pretty happy with the 23mm, so maybe there’s some variation within the line. I went for the sideways aspect ratio this time, but I didn’t quite get the camera square on to the view. Guess I’ll just have to try again next month. 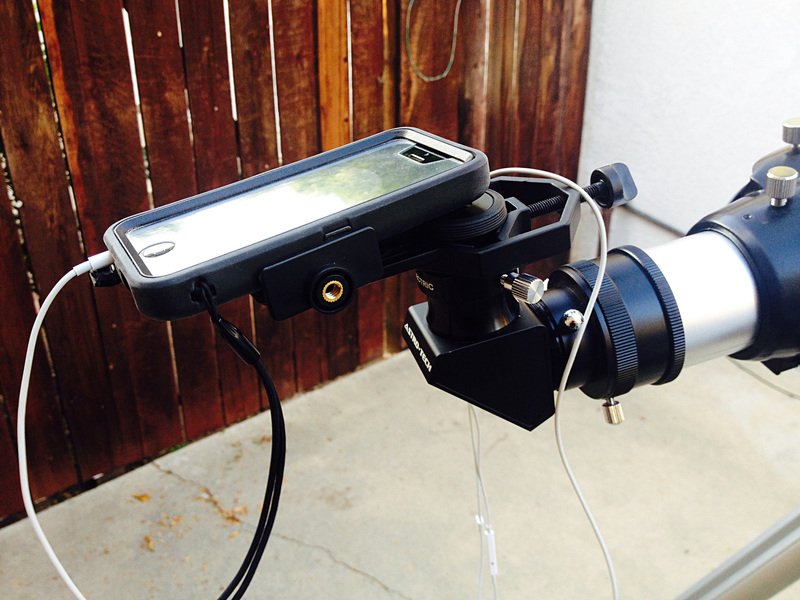 As I mentioned in the moon video post, I recently got a GoSky universal cell phone/eyepiece adapter . So far I’ve tested it on some birds during the daytime, and on the moon after dark. 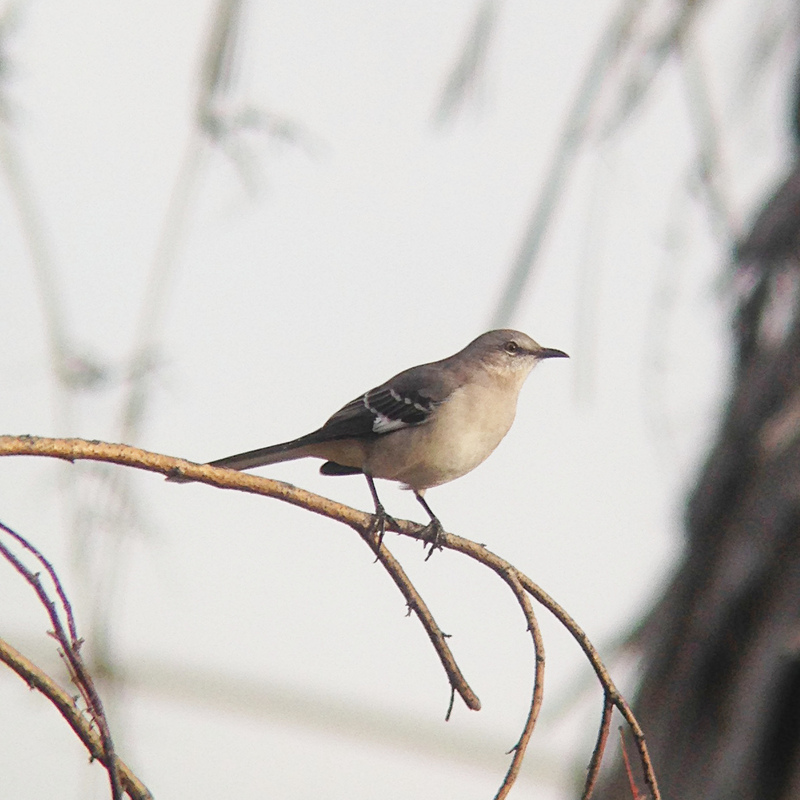 Here’s a Northern mockingbird at 50x, about 125 feet away. I did most of the digiscoping with my C80ED and a 12mm Plossl (50x). I tried other eyepieces but for my purposes the 12mm Plossl delivered the best balance of magnification, true field, and image brightness. If you haven’t seen one of these cell phone adapters, it has a diamond-shaped, padded clamp that screws down around the eyepiece, and another padded clamp to hold the phone. The bracket for the phone can slide up and down and rotate relative to the eyepiece clamp, so you can get the phone’s camera centered over the exit pupil of the eyepiece. As you can see here, the phone bracket is wide enough to hold an iPhone 5 with a heavy Otterbox case. I prefer to leave the case on while shooting – it’s rubber, so I can crank down the adapter bracket and make sure the phone is truly secure. Plus, it’s one less thing to do during setup and teardown. You may be wondering why I have earbuds hooked up to the phone. 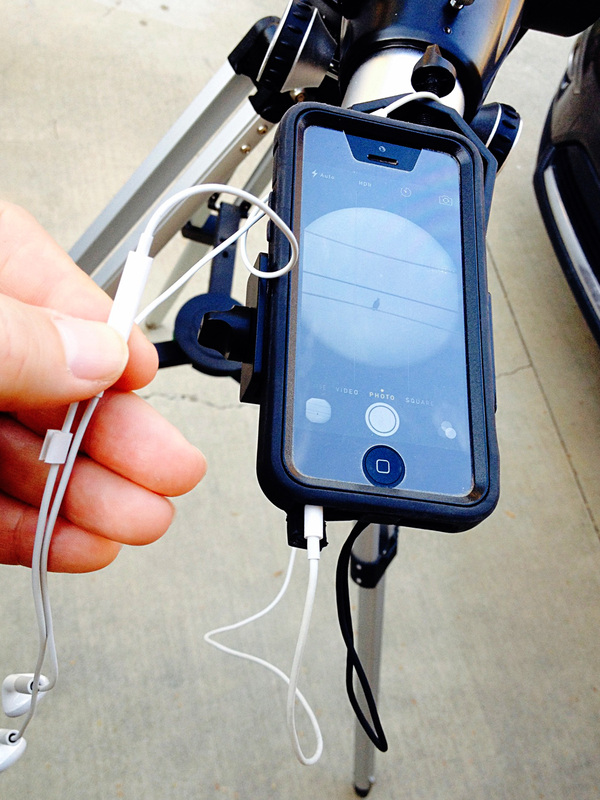 It’s because of a very nice feature with the iPhone 5 and 6 (don’t know about other iPhone models or other brands of smartphones) – the volume buttons work as shutter release buttons, which is often handier than trying to press the button on the screen, AND this functionality extends to plug-in volume buttons like those on the earbud cords. So you can plug in your came-with Apple earbuds and use the volume control there as a remote shutter release for hands-free, no-shake photography. 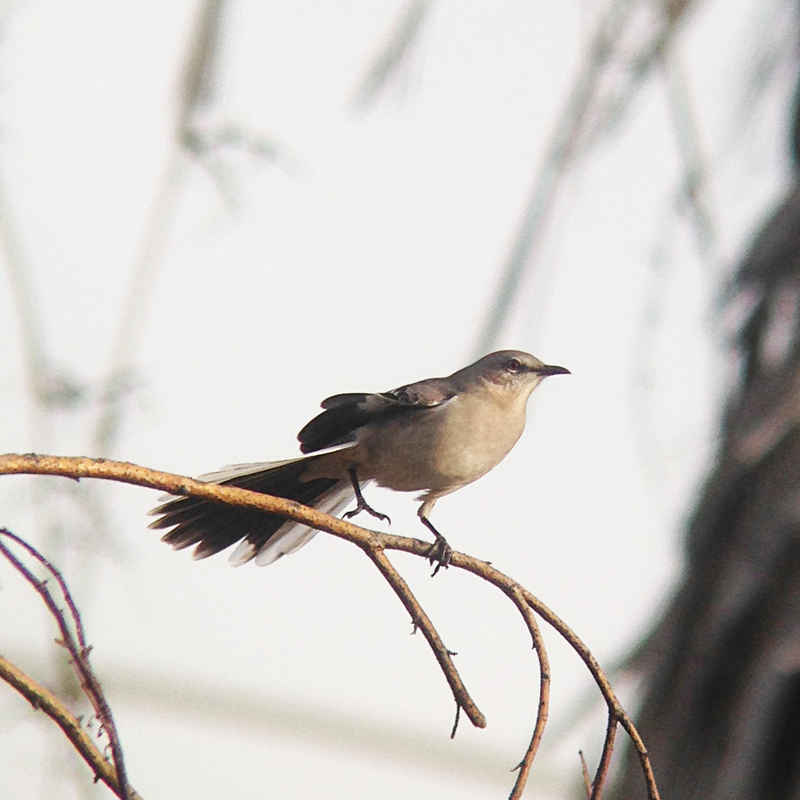 That mockingbird again, fluffing its tail feathers. Here’s one of the moon. The seeing was punk last night so I know the system was not performing anywhere near its limits. I’ve done far better holding the phone by hand on nights with better seeing, but only by dumb luck, taking loads of pictures, and throwing away all but the best. Using the adapter I get much more consistent results, even if the seeing makes them all consistently lousy on a given night. 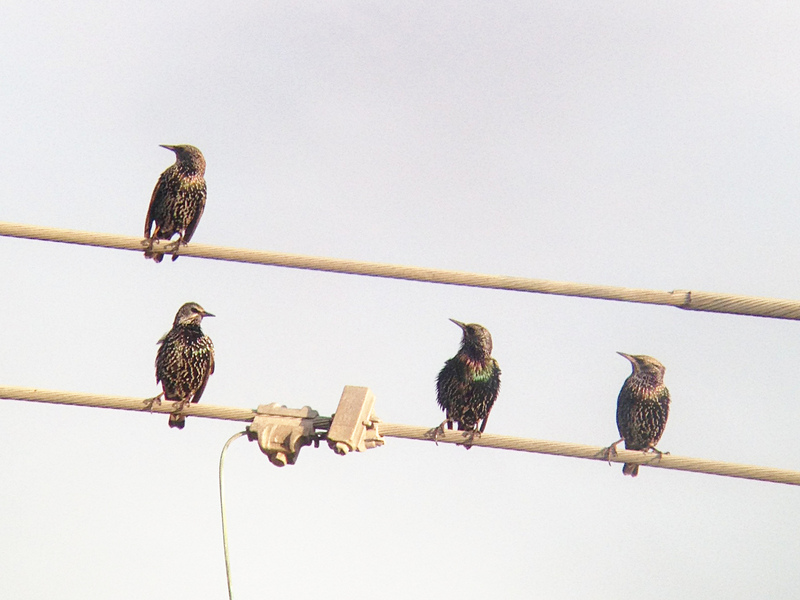 These are European starlings at 50x, again with the 12mm Plossl, from about 250 feet. I did lots of back-and-forthing between camera and the various eyepieces to confirm that the distortion was in the camera and not in the telescope or eyepieces. It’s a fairly minor annoyance for me – I’m not expecting world-class results out of my smartphone camera. Just something to be aware of. 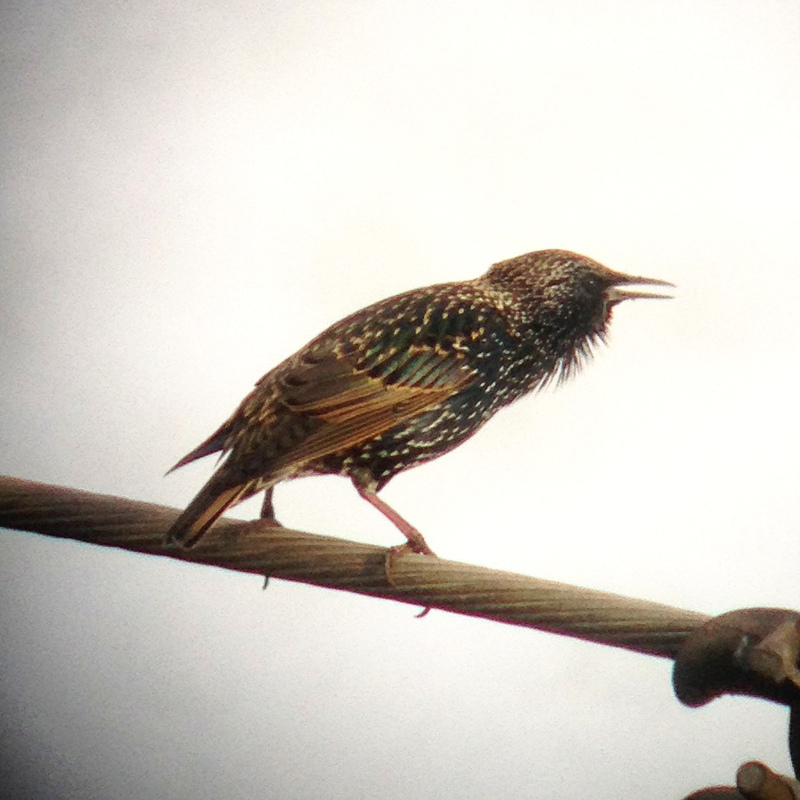 I tried going up to 100x with the 6mm Expanse on this starling. It caused a lot of vignetting – even in this severely cropped photo, you can see that the corners are dark. I’ve had this problem with using too much magnification with handheld afocal photography as well. I think that as magnification goes up and the exit pupil goes down, it’s progressively harder to fully illuminate the camera’s CCD. This may seem like a lot of caveats and complaints – distortion, vignetting, etc. – but they’re all problems that come along with doing afocal photography with a phone. The adapter itself is dandy. It holds the phone and eyepiece securely and without stressing either one or leaving a mark, it’s easy to put on or remove, and it adjusts easily. I wish now I’d gotten one a lot sooner. There are lots of interchangeable brands on these things – if you want the GoSky verison, it’s here . 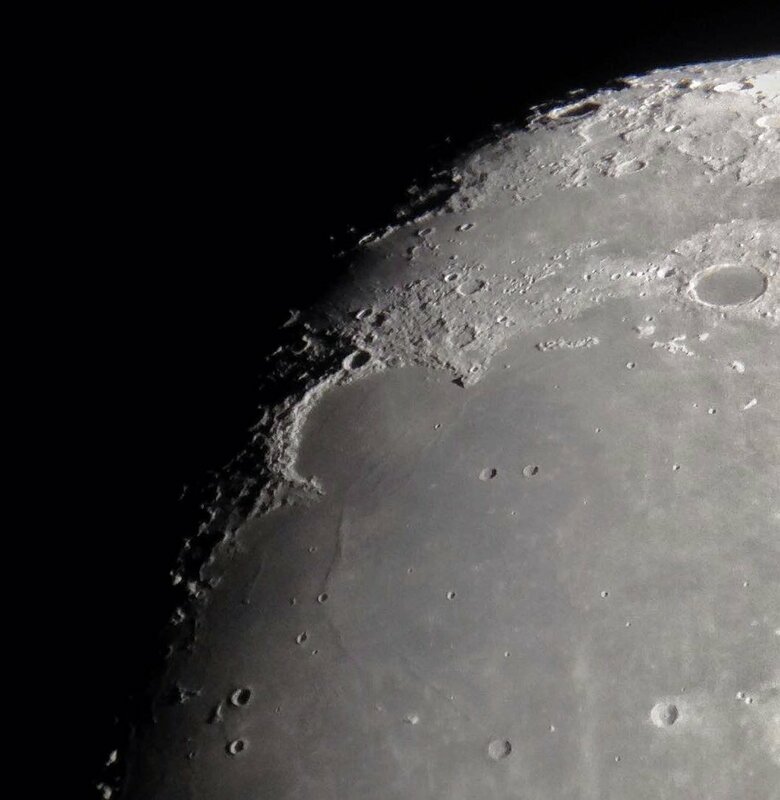 Taken at 7:43 PM PDT last night, from the top of the parking garage in downtown Claremont, using a handheld iPhone 5c shooting afocally through an Orion Apex 127 Mak and a 12.5mm Plossl eyepiece. In other news, no, I’m not dead. Just been busy with teaching. But I have some exciting astronomy news coming up later this fall (finally revealed here! ), and in the meantime, I’m looking forward to the total lunar eclipse this coming Sunday evening, September 27. 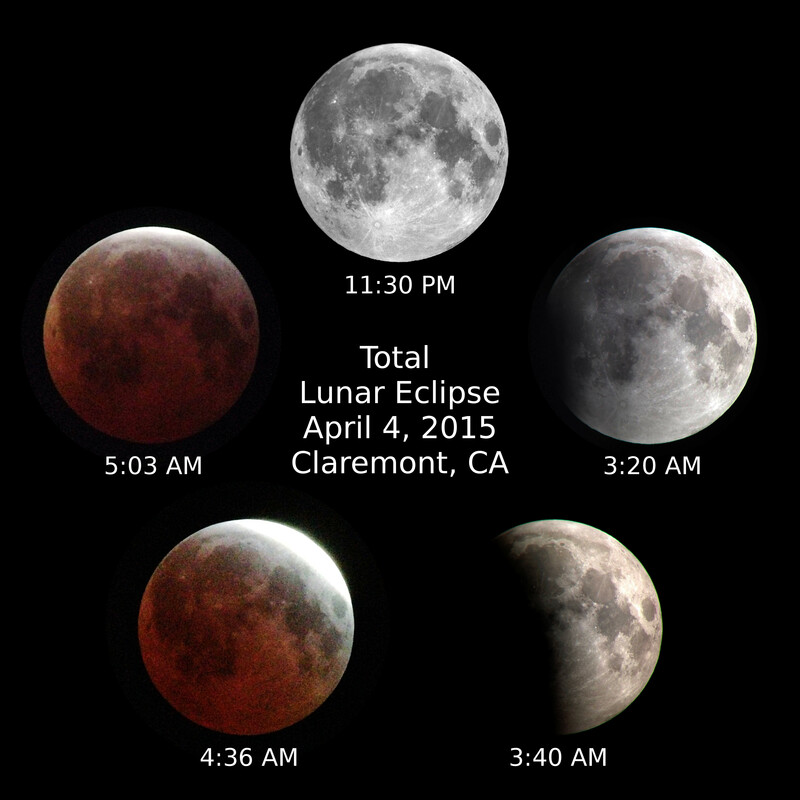 I stayed up late Friday night to catch the beginning of the lunar eclipse early Saturday morning. 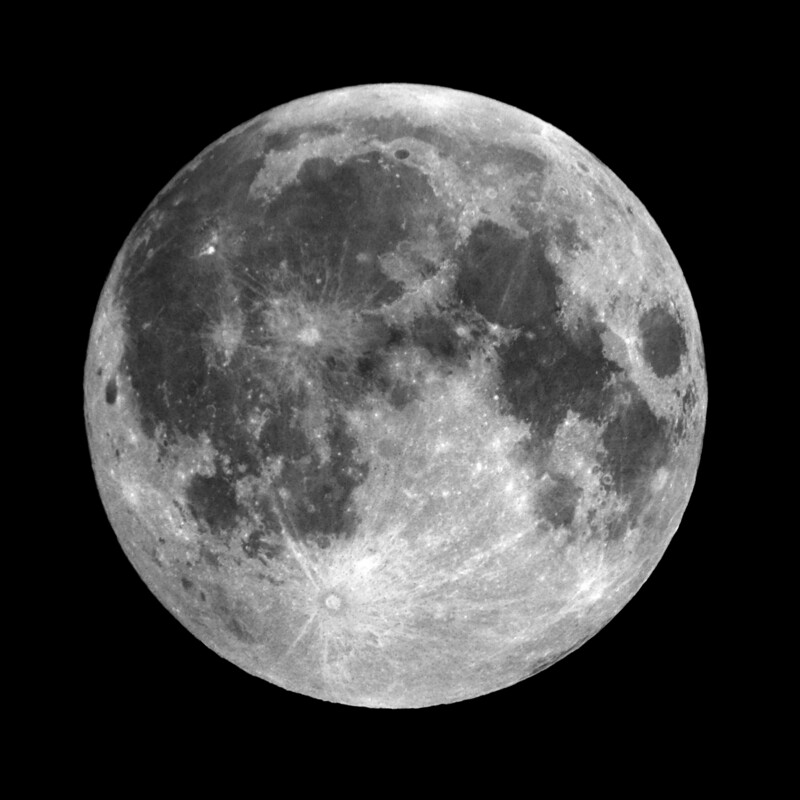 The penumbral eclipse started at 3:16 AM local time, and it was still going on when the sun rose. The umbral or ‘total’ eclipse was very brief, just five minutes between 4:58 and 5:03. Just like last October, I got London up to see it. 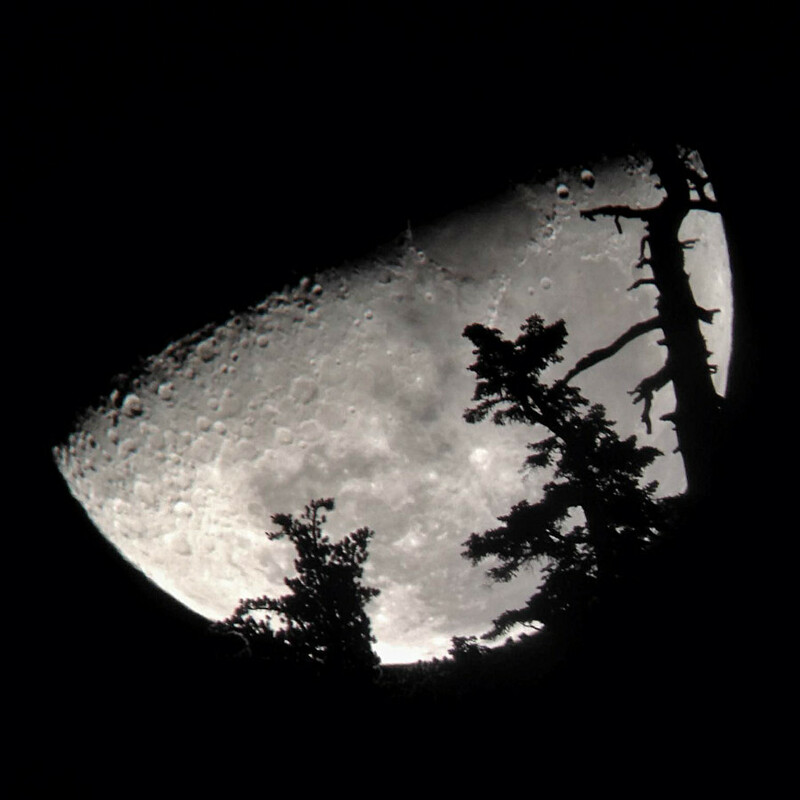 He was kind enough to loan me his 60mm Meade refractor for the event, and he used his XT4.5. The little Meade refractor made photography easier by cutting down the light level without sacrificing contrast. 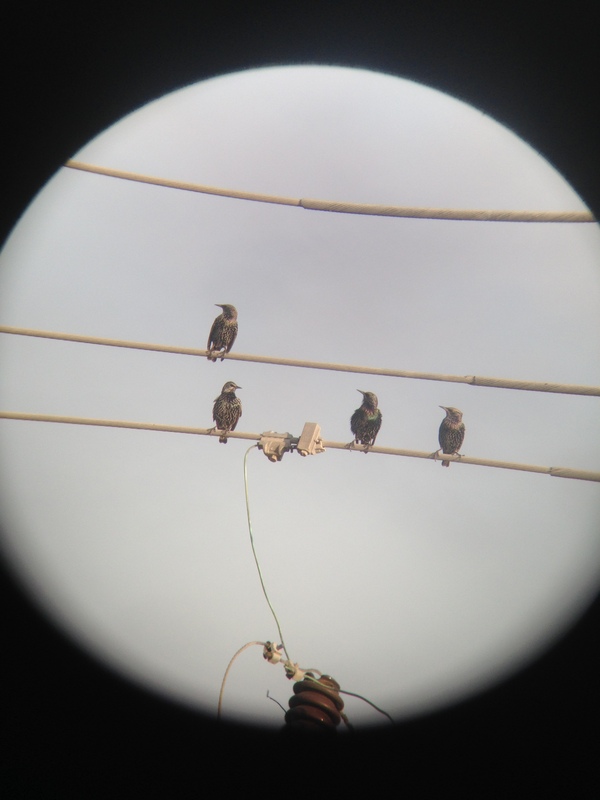 I took all of these photos with my iPhone 5C shooting through a Celestron 8-24mm zoom eyepiece. As usual, I processed and composited the photos in GIMP. I’m particularly happy with this shot of the full moon. I really need to do a composite image with all of my best full moon shots. One of these days.